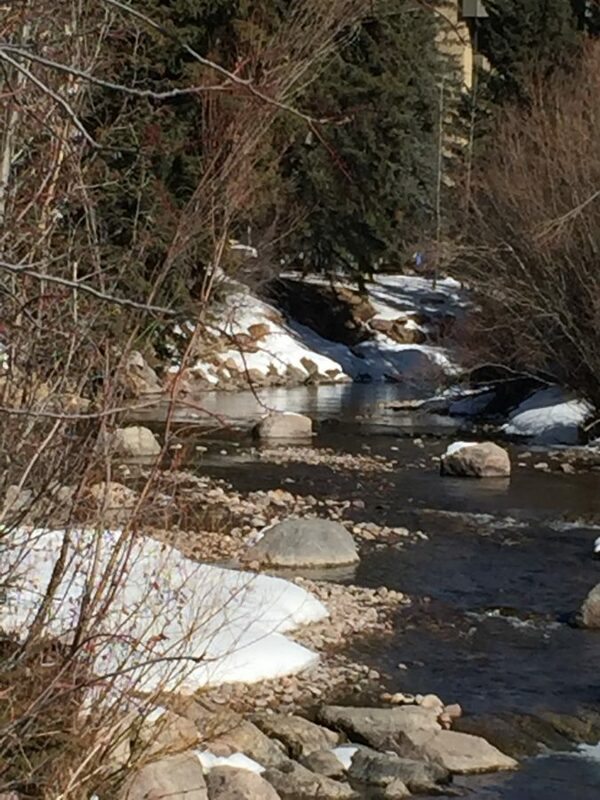 I promised more photos from our trip to Vail so here goes. 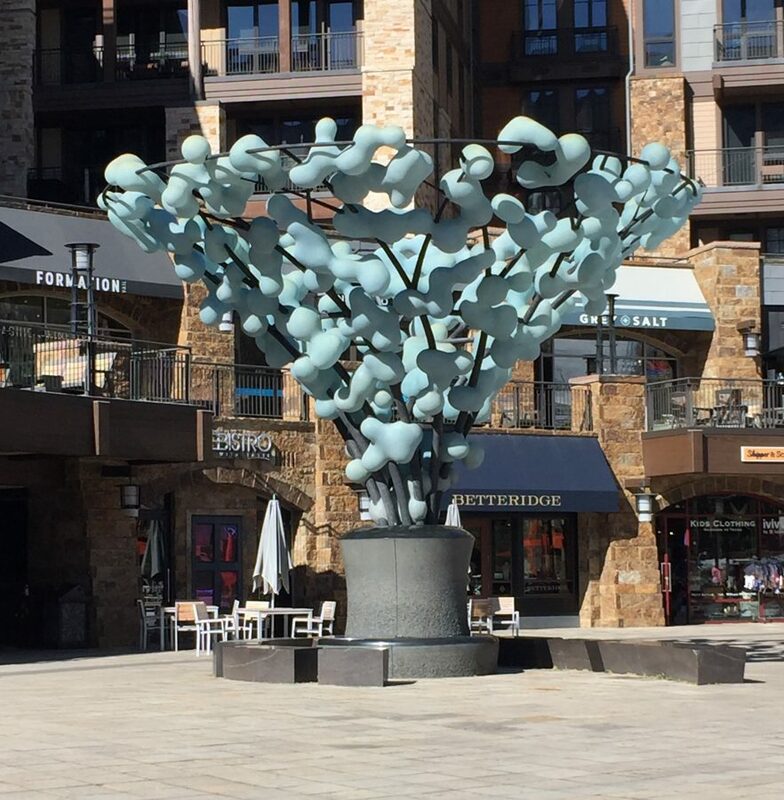 But first you might find it interesting to hear about what’s the same and what’s different about Vail from nearly a dozen trips through the years. 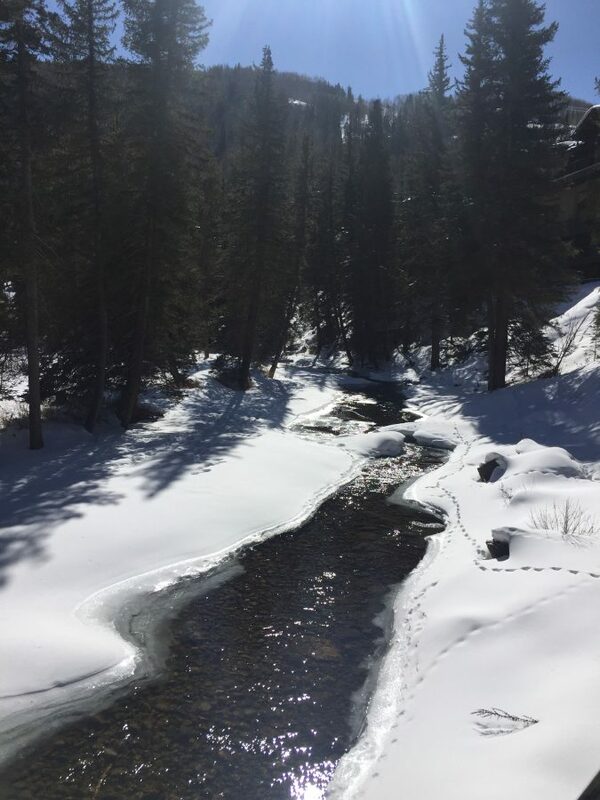 What’s the same…the beautiful snowy trails on the mountain, the pricey shops and restaurants, the little tykes learning to ski, the friendly dogs frolicking along the streets, and the free buses which take you anywhere you want to go. Most are hybrid electric. What’s different… metallic skiwear, the absence of cowboy hats, a tremendous upsurge in new condos and resorts (can we say over-built?) and of course, the newest gondola. We also noticed there is now an effort to recycle ski maps. In case you’re wondering about the gondola ride to the top of the mountain if you’re not skiing, the cost was $42.00 per person! 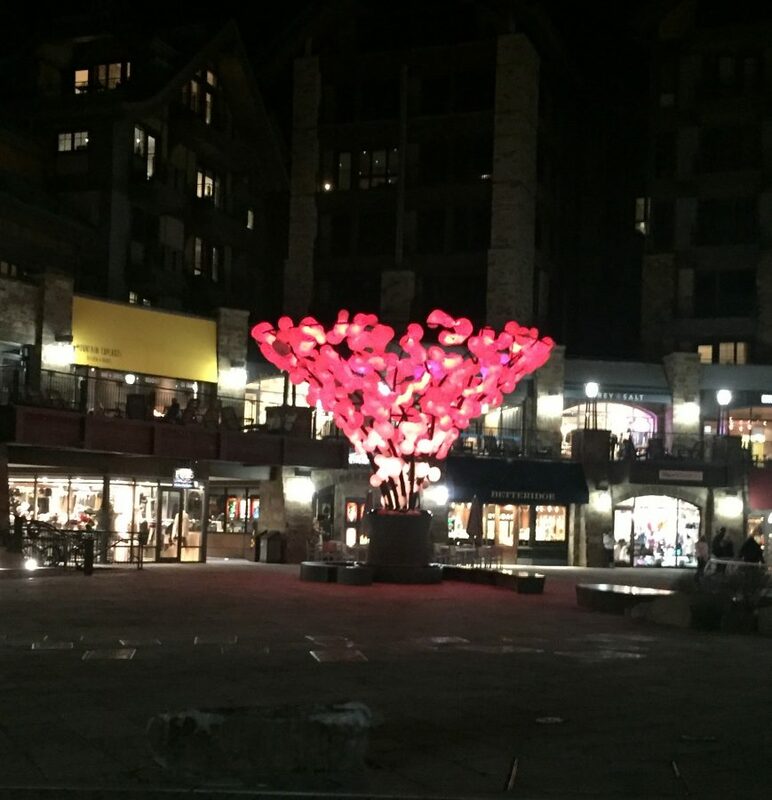 Aint’ nothing cheap in Vail. Today is our last day and we’re expecting some snow. Up top – Two Elk which sadly we can’t get to despite all of our efforts. We had hoped to take a snowmobile over to it, but no such availability. Fantastic view of the back bowls. 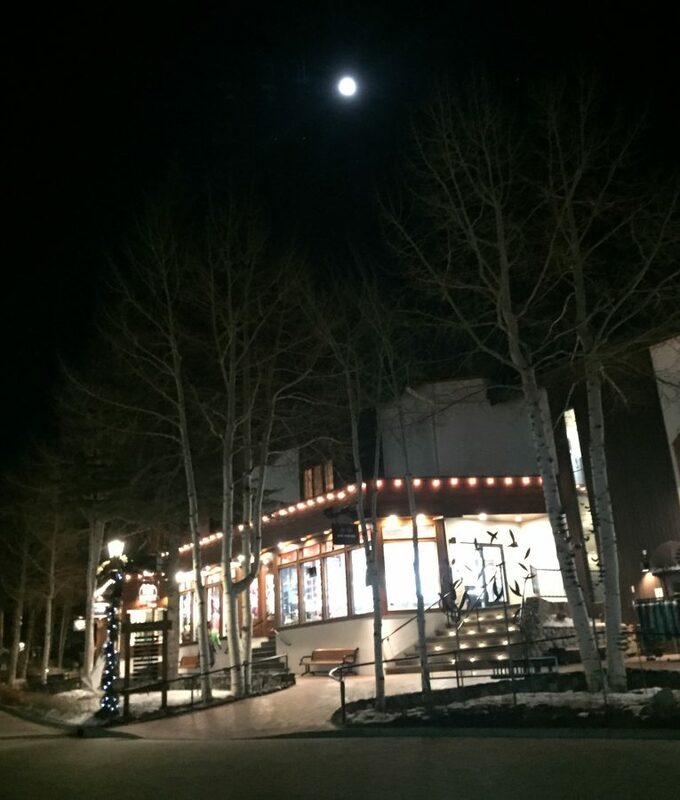 Beautiful full moon over downtown Vail. 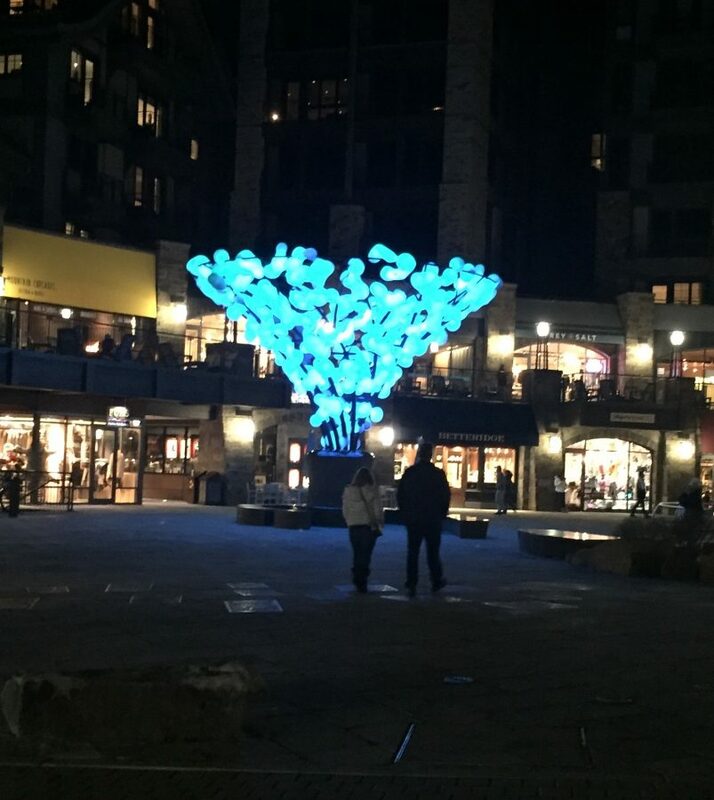 The sculpture changes colors at night. New resort called Solaris which has the second ice skating venue. This red shrub is a variety of Dogwood. We learned this from visiting the Betty Ford Alpine Garden which was a little disappointing because it’s winter. Highly recommend as a summer stop. Pepe’s German restaurant and bar with movie star Jane. 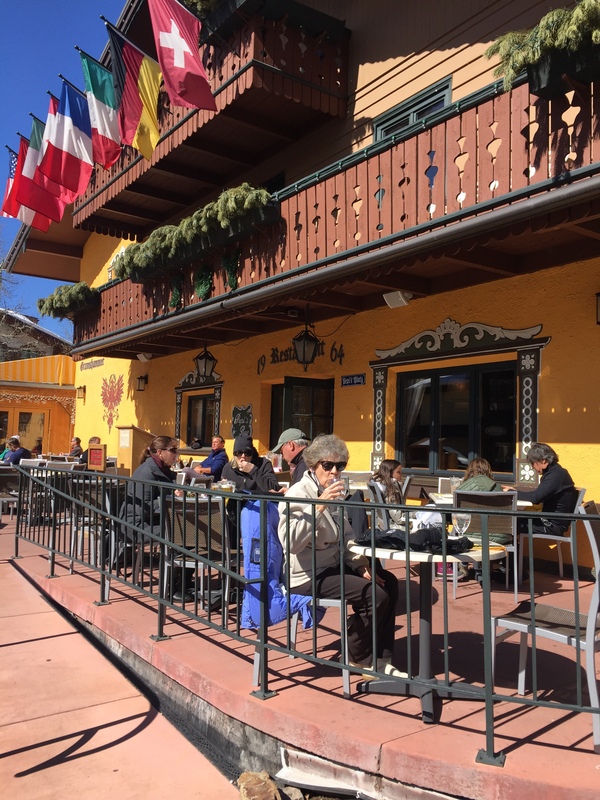 Fun place with decent food and great patio for a sunny day. Sorry the pics are a bit out of order but we have a very slow Wi-Fi and hard to get it just right. 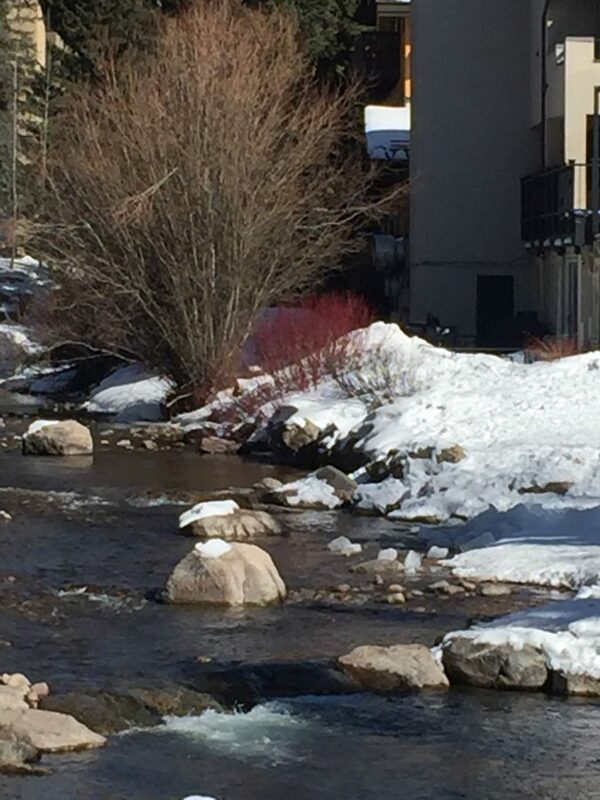 Love traveling and sigh seeing vicariously in Vail. Fun, exciting and adventurous as always! Your photos make me want to visit again in the winter and see snow in that beautiful setting. Summers are pretty too. Thanks for all the sharing & photos! 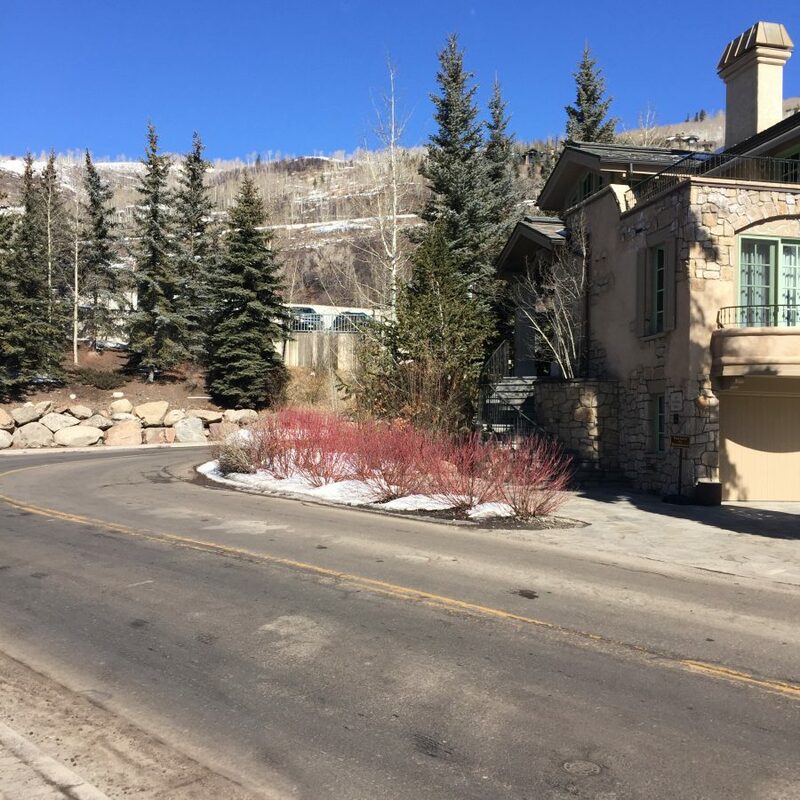 Linda: We’ve been to Vail and other ski resorts during summers and we’ve wondered – 1) are there shuttles that allow you to travel around without driving, 2) are the sidewalks, paths, etc. clear enough to walk around safely, 3) do you wear clothes there that you never wear anywhere else, 4) are there comfortable viewing locations where you can entertain yourself watching others on the slopes, 5) are there very simple outdoor activities(sledding) for those that don’t want to or can’t develop the skills needed to ski, snowboard, or ski jump in a week’s time? Pat, I’ll try to answer all of your questions based on what I know which may or may not be all the info you need. 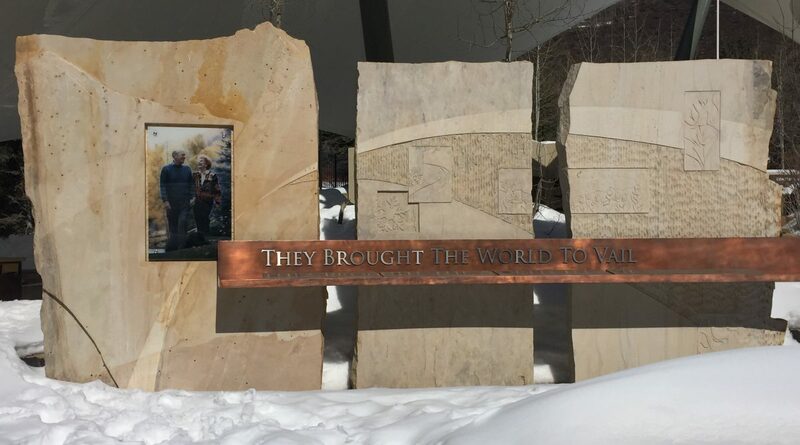 (1)Within the city of Vail from east to west and even across the interstate, there are free buses. 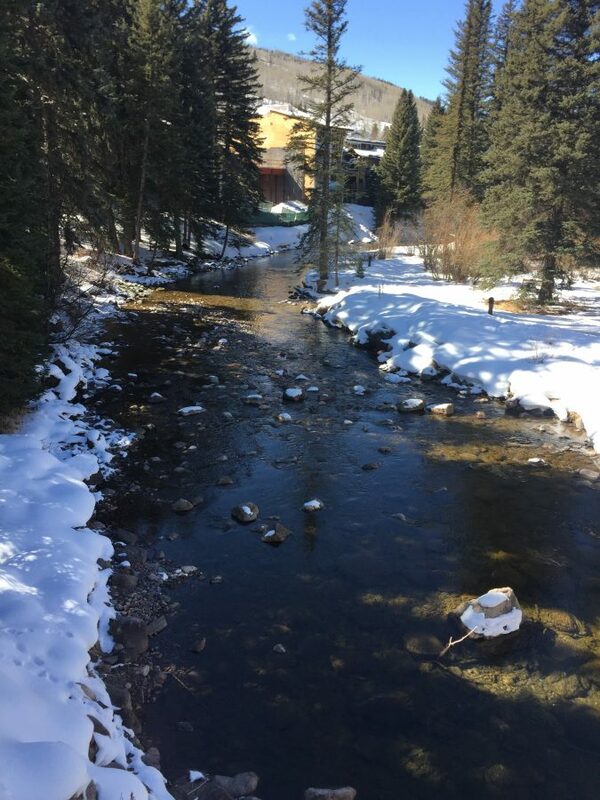 If you go to the transportation center in mid-Vail, you can catch buses for a nominal fee to other parts of the area like Beaver Creek and Breckinridge. (2)We have had no fresh snow so all roads and side walks were completely clear; however, if it snows that is definitely not the case. (3) We have worn our ski pants and ski jacket here for warmth, gloves, hats, etc. (4) At the base of the large lifts you can see the ski runs and enjoy a bite to eat outside in the sunshine if not too cold. (5) You can take a snowshoe tour and cross country ski tour or rent a snowmobile with a guide.There are also sleigh rides in the evening for dinner sites on the mountain. All of this is quite pricey!